Discussion in 'Frontpage news' started by Hilbert Hagedoorn, Jan 6, 2019. Maddness and Solfaur like this. I cant wait to hear how it just works. sverek, -Tj-, Solfaur and 1 other person like this. is funny how this big ceo's of silicon valley (not SV in some cases but electronic world in general) have created a character around them, the even use the same clothing in any public apparition. it would be cool to see a fighting game with this characters (lisa, jensen, elon, bill, brian. etc.). fantaskarsef, Elder III, Solfaur and 2 others like this. That's 5 AM European Central Time. So as Nvidia keynotes last 5 hours and only the last half an hour is interesting, if one connects at 9:30, one will get the good stuff!! Happy Monday. Unfortunately, any enthusiasm I might have had for Nvidia has been pretty much depleted after the shambles that was the rip-off, bar-raising pricing of the RTX series. I've no issue with their innovation and I really do applaud this, but (with a 1080) the pricing halted my own gfx card upgrade cycle, and I'm sure, others. For damage limitation, I'd imagine they could provide GTX options for middle and high-end with pricing we're more used to - I can't see them currently reducing pricing on middle and high-end RTX options without significant backlash from those who already purchased. But then again, reduced cost GTX options (that perform just as well as RTX-Off) will likely not sit well with many in this same group since performance gains was their primary purchase criteria (RTX On 'issue' known entity then). Hmmm, will be interesting to see how they handle all this. I wish them well, though wish AMD an even greater and most excellent 2019 and beyond - invest that tech and deserved profit into low-high end gfx cards too ! Elder III and Solfaur like this. jura11, chispy, Solfaur and 1 other person like this. fantaskarsef, chispy and Solfaur like this. 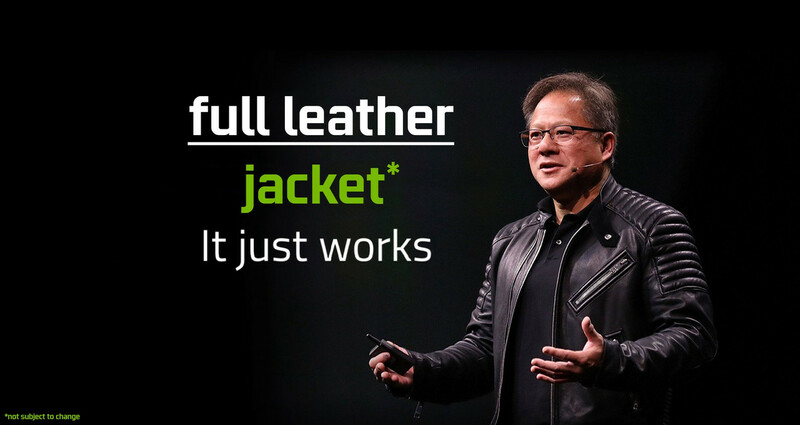 EVERYTHING JUST WORKS (provided you have a leather jacket on)! chispy, Undying and Mesab67 like this. Where can i find a similar type of leather jacket? BlackZero, -Tj-, Loobyluggs and 1 other person like this. m4dn355 and Undying like this. 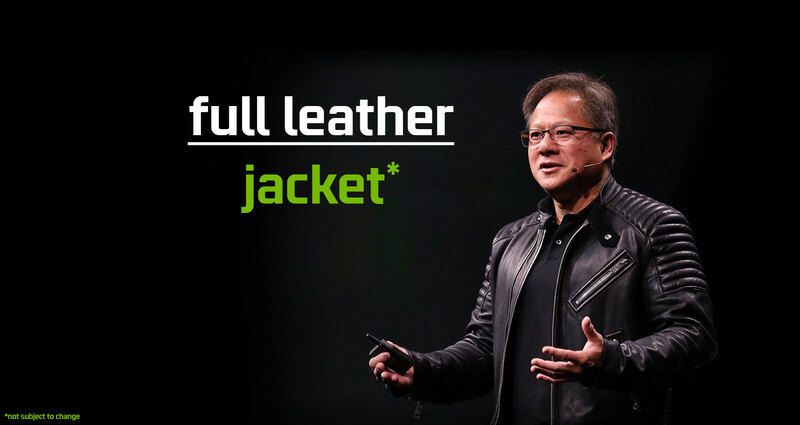 Where can i pre-order leather jacket with 3.5... pardon, 4GB of vram and rtx effects? Did he really announce Freesync for selected monitors, in the Jan 15 driver? Please tell me I understood correctly. Pretty much. Wonder how that will work in comparison to Gsync. Yep, that's what he said. Probably mostly freesync 2 monitors. But it's a good start. It was something that they had to do. I know a lot of early freesync monitors where crap, but this is great news. I didn't think it was possible to run DLSS and Ray Tracing at the same time. But in that video, it did and it was a big step up in quality at 1440p. The Ray Tracing affects were amazing, to see stuff that wasn't on the screen but was rendered looked very cool. I'm more convinced than ever that this is the future for graphics. I really, really hope AMD gets on this and can release some info with the Navi launch at CES. I hope AMD stays away from the top end graphics sales. Its enjoyable seeing the people who put them into this position getting whats due. Shadow of the Tomb Raider, but really bad implementation.